For the better part of the last 4 years, I felt out-of sync, out-of-control, out-of-myself, out-of-energy (and pretty much anything else you can be “out-of”). It’s taken a huge toll on my mind and body, not to mention my family and those around me. During that time I cared for my father who unexpectedly needed major heart surgery…all while pregnant with my first child and managing some major shifts in my business. A few months after my son was born, I had the brilliant idea of opening up the Body Project studio. A massive undertaking I’m not sure at the time I was completely prepared for. I remember for the first couple of months after my son was born, I was nursing him on one side, pumping the other (you get the visual, don’t you…) and I had my laptop in front of me working on my business. As many of you well know…that multi-tasking didn’t last long. I so vividly remember that day I had a meltdown because I was “trying to do it all” but frankly, I was doing a pretty crappy job at it. Because I was trying to do it ALL AT ONCE. What I really lost what was the energetic center of everything I love so much in my life: I was losing myself. I realized that if I wanted to be successful as a mom AND as a wife AND as an business owner AND committed to my clients and employees AND volunteer AND, AND, AND…I felt like I needed more discipline in my life. When I am at work, I need to be entirely focused on work…not spending valuable energy feeling guilty that I had to leave my family home. My work gives me purpose and when I feel I have purpose, I am a better mom, a better wife and far more successful in my work. So in 2015, I decided to try a new twist on a New Year’s Resolution. Instead of a goal or resolution, I made a personal promise. He talks about how success isn’t luck of the draw, or even because of enormous talent; rather success comes as a result of practicing self-discipline. The book goes through about 21 different aspects of life and how self-discipline can create more meaningful, life-long success. It’s like the timing of seeing that book was an affirmation from the universe. I needed more self-discipline in my life. So I made the personal promise to practice self-discipline. Many may equate self-discipline with “restriction” or “willpower” – like we often use when it comes to what foods to eat or not to eat or with sticking to an exercise routine, etc. But rather than seeing self-discipline as restriction or trying to employ willpower, I looked at it as an opportunity to discover what self-discipline looks like for me in order to get off the vicious downward spiral of feeling out of control and lacking purpose. Basically, I wanted to stop going through the motions and start feeling like I was the determining my success in all the roles I have in life (and if you’re reading this…I bet you have as many, if not more of these roles you take on daily). So I started off on my path of self-discipline…not really sure what it was going to look like, but had confidence that over time, it would make sense. I was noticing that there were certain thoughts I was having on a regular basis that triggered negative actions (after all…thoughts determine your actions and actions determine your thoughts…). For a while, I actually began to resent my work because it “took” time away from my family…even though I LOVE my work! I became burnt out, physically, mentally and emotionally. The way I recharge IS with taking small opportunities of “me” time…without this, I serve NO ONE. And then there was self-discipline in my actions. This was really a game-changer for me. I started to notice that there were a few actions that when I accomplished them, it would have this profound domino effect. I began to practice self-discipline with these game-changing actions…what I called my “non-negotiables.” And they are exactly that: NON-NEGOTIABLE. Map out my week on Sundays: Lack of organization is my kryptonite. I commit anywhere from 1-2 hours every Sunday mapping out what my week looks like ahead; both for my business as well as for family/personal commitments. This serves me far better than a simple “to do” list…it keeps me accountable to doing only what is realistic given my schedule and commitments (this is what trips up so many women…we THINK we should be able to do far more than is realistic, then feel like a failure when we can’t get it all done). If I don’t do this…my week literally is a wash…and I HATE this feeling! Purposeful movement everyday. Not crazy workouts, not 1-hour of cardio…I just need to focus on MOVEMENT. It might be a specific workout or class, lifting weights, or a yoga practice, or a 10-walk, or some light stretching at home. But I need to move my body daily. And do it purposefully (not with an all-or-nothing exercise routine). Eat a serving of greens at least twice a day. Simple…when I eat more greens…I feel better. Don’t eat anything unless it’s on a plate. This keeps me from those 3pm windfall of snacks that inevitably becomes one continuous meal through dinner. Daily G.S.B. check-in. I have a journal I keep next to my bed. Before I go to sleep (on most nights) – I take a couple moments to jot down: one thing I’m Grateful for; one Success I had that day; and one thing I can do to Be a better version of myself tomorrow. Honestly, this can actually be really difficult sometimes. Especially because as women we’re so focused on everything we DIDN’T do. But this is where self-discipline of my thoughts and actions become clear. When we seek out what we’re grateful for, what we actually succeed at, and focus on how we can be better (and this isn’t a “I won’t eat chocolate tomorrow”-sort of be better)…we’re far more likely to engage in actions that actually serve us. 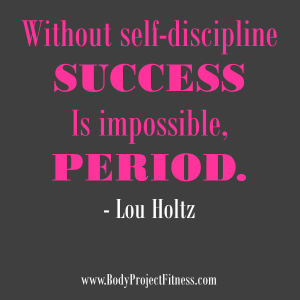 So try giving yourself a personal promise of self-discipline! Create a few non-negotiables; come up with a mantra that you repeat to yourself when your thoughts are not serving you. THIS WORKS! 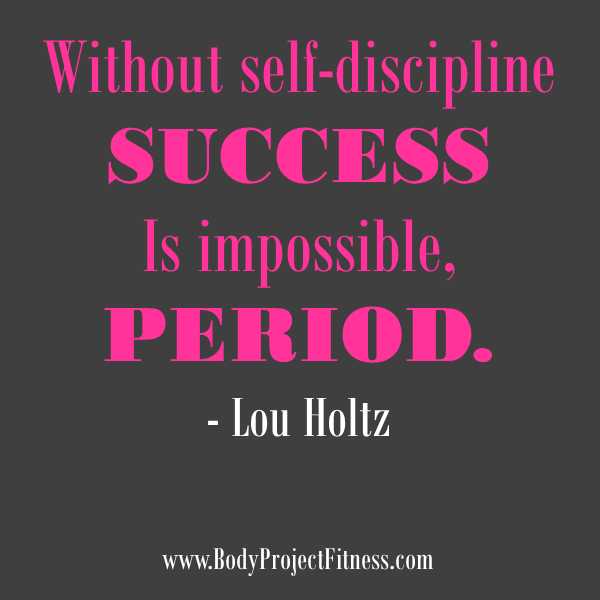 Cheers to self-discipline and always working toward a better version of yourself! P.S.S. Many of the self-discipline strategies I mentioned above are a core of the 8-Week Body Project…if you need more discipline in your life or feel like you’re stuck in a mind and body that isn’t yours, I’d encourage you to give yourself the time to consider this life-changing program.